Getting a good deal on pet friendly hotels in Orlando near the world’s most visited theme parks can be a bit challenging. Orlando is popular at any time of year. While this means there are usually some deals to be had, it can also makes timing a large part of the price you get on a hotel and its availability. Competition for hotels with the best rates is fierce, and many families try to figure out the most cost effective way to travel. Check out our Orlando Travel Guide developed to make travel easy for pet owners. Here you will find nearly everything that is pet friendly in the area. Remember, even though Vacation Pet Friendly lists more than 86 pet friendly hotels in Orlando where you can make reservations, booking early is the most important thing you can do, especially if you want to catch some of our special deals. Here are some hotels we recommend if staying close to the attractions is important to you. Often, when traveling with pets, this is mandatory, as you may want to peek in once in a while. Plus after a long day at the parks, you want to pick your cat or dog up from a pet sitter or doggie daycare that is on the way back to the hotel. This hotel is a half mile from Universal Studios. Pet owners will enjoy an outdoor swimming pool, daily continental breakfast and free WiFi. The La Quinta Inn Orlando – Universal Studios usually has an ongoing starting price of $44 a night, which is exceptionally reasonable. You probably won’t be spending too much time there if you are in Orlando to visit the attractions. This hotel is convenience because it is located nine miles from downtown. 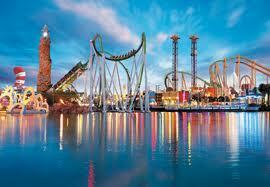 And within six miles, you will find Wet ‘n Wild, SeaWorld Orlando and the Orange County Convention Center. This is a good family style hotel if you are on a budget, yet want someplace comfortable to relax. This is one of the most pet friendly hotels in Orlando. It allows dogs up to 80 pounds. It’s special because of it’s close proximity to all the Disney attractions including the Magic Kingdom Park, Hollywood Studios, Animal Kingdom Them Park and Epcot. It has a South Beach flavor and there are new furnishings. The hotel houses 490-rooms. If you’ve never stayed in an extended stay, you will quickly learn that it is the perfect place for any stay over three nights, especially with kids and a pet in tow. Extended stays have fully equipped kitchens and all the utensils. The Extended Stay Deluxe Orlando offers our pet travelers free WiFi, plus an onsite laundry facility and a complimentary continental breakfast. Breaking up the visits to the theme parks with more relaxed days around town is a great way to keep from being burned out. Check out our pet-friendly events, parks, restaurants, shopping and much more simply by typing the city name into our Plan – Travel Guide search box. We have tons of listings and you will find plenty to do. You can easily take animals along on day trips – just remember to pack a collapsible water bowl and carry water with you for periodic breaks, just as you would for kids. If your day plans include activities that your pets can’t enjoy, check the Pet Hotels of America listings of local doggie day cares or kennels. Be sure to carry multiple copies of your pet’s vaccination records, as many kennels and other types of temporary pet lodging facilities will require these. While the number pet friendly hotels in Orlando and throughout America is increasing and growing in popularity, it pays to do a little research and see what the policies are for each individual hotel. The requirements most pet friendly hotels in Orlando include are within their pet policies, which vary between hotels. The pet policies dictate the maximum weight they allow for pets, let you know if you will be needing a crate for when you leave the hotel, the deposit cost, cleaning fees and more. For instance, some of the hotels will allow your animal to be with you in the room, provided you bring your own crate. Others will require animals to spend the night away from their owners. 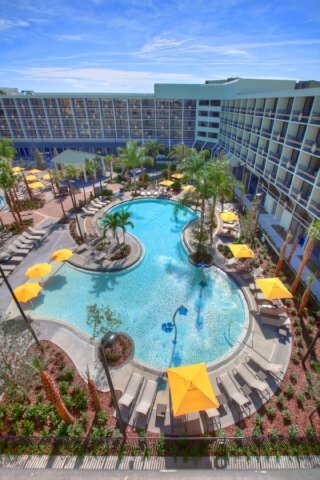 There are many great deals on friendly hotels in Orlando. Remember, booking early is essential when traveling with pets. See what’s available today so you get the best deals. Start your search for pet friendly hotels in Orlando here. Then sit back and think of all the fun things you can do when you get there! Also remember to browse through our Orlando Travel Guide for things to do, diners to eat at and shops to visit. Planning your entire trip can now be done from one website –Vacation Pet Friendly.